Posted November 4, 2018 at 12:00 am . 1 comment. 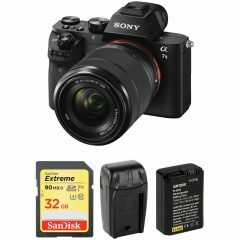 B&H Photo Video has a very hot bundle of the Alpha a7 II with FE 28-70mm f/3.5-5.6 OSS, 32GB Extreme UHS-I U3 SDHC 90MB/s, extra battery and charger for only $998.00! This is a $600 savings from the regular price of $1598 for this camera and the lowest price seen yet for this full-frame mirrorless camera. Adorama has a similarly great bundle with a 32GB card and other free accessories. Be sure to follow www.sonypricewatch.com for other great Sony deals going forward. Adorama has a better bundle for the same price.